I just started using Seventh Generation products recently as well and am quite pleased with the results. So far I've only found their laundry detergent and multi-surface cleaner in our local Target. I hadn't thought about bleach in paper towels... I'll have to pay more careful attention the next time we purchase paper towels. We put a brick in our toiler tank...saves water! Thanks for the chance missy! We put 2 rain barrels out in our backyard! We are saving lots of water! I follow you on Twitter @ molomatic too! Thanks! I unplug all appliances when not in use. I planted my first vegetable garden. I've been recycling more things than I used to and switching to more green products this year. We have been air drying our laundry rather than using the tumble dryer! I went to their website and learned that they have saved 377,487 trees so far! That is so fabulous! I've bee buying more all natural cleaners. We recycle and re-use all we can. I also now only wash full loads of laundry (usually in cold water) and only run the dishwasher when full. Thanks for the review and giveaway! We also re-use sandwich bags for our son's lunch so that fewer bags end up in the garbage. We started gardening organically and making our own compost from kitchen peelings/scraps and lawn trimmings, brush, leaves, etc. We stopped using chemicals on our lawn and garden. I've added more storage capacity to my rainwater harvesting system! I can now store up to 3400 gallons at a time. And, if I use some of the water between storms, I can capture even more. I'm using it to water my fruit trees and veggie garden (think eating VERY local!). 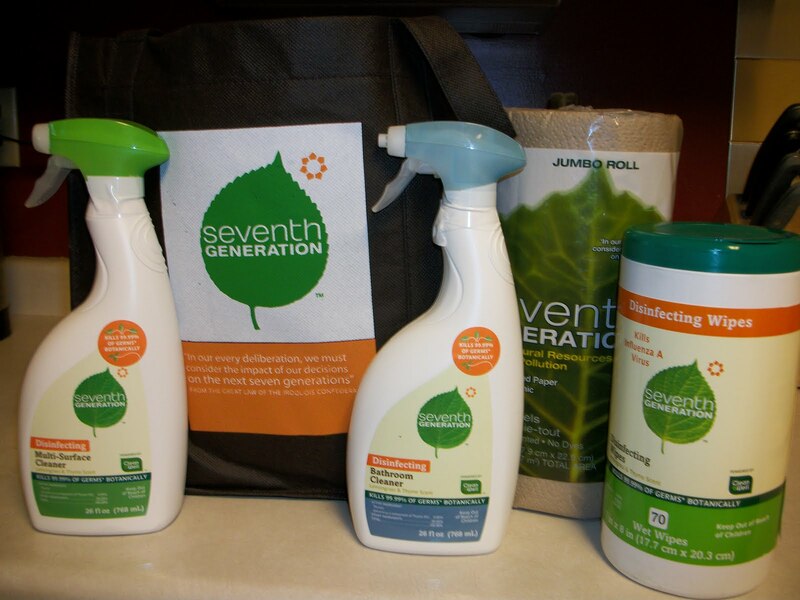 For the past 20 years, it’s been Seventh Generation's mission to help us protect our world with their naturally safe and effective household products. They have great high value coupons on their website! Love that! I wash clothes in cold water with a mild soap containing no perfume or chemicals, and hand the clothes out to dry. I went to their website and learned that... Every day the average person comes in contact with 60,000 different types of germs. Yikers! On the Q & A section of the Seventh Generation website, I learned that: A botanical disinfectant is a product that is used on hard surfaces and kills germs using plant derived ingredients. In Seventh Generation's Disinfecting Sprays & Wipes, the germ-killing ingredient is thymol - a component of thyme oil which is derived from the herb thyme. Something I did for the environment. I clean with only green products and homemade concoctions like baking soda and soap and vinegar. If you go to the COUPON section of the website, you can print coupons for $1.00 off on baby care items, laundry products, disinfecting sprays, and any Seventh Generation products! I went to their website and learned that VOC emitting materials may introduce carcinogens, mutagens, reproductive or developmental toxins, neurotoxins, endocrine disruptors and other harmful chemicals into the indoor air of your home! I recycle everything and use all natural cleaners! Palm kernel oil, which is used to make our plant-based cleaning agents, has the single biggest environmental footprint of any raw material we use in our products. I learned on the Seventh Generation site that they are determined to inspire others through innovation, education, and interaction. 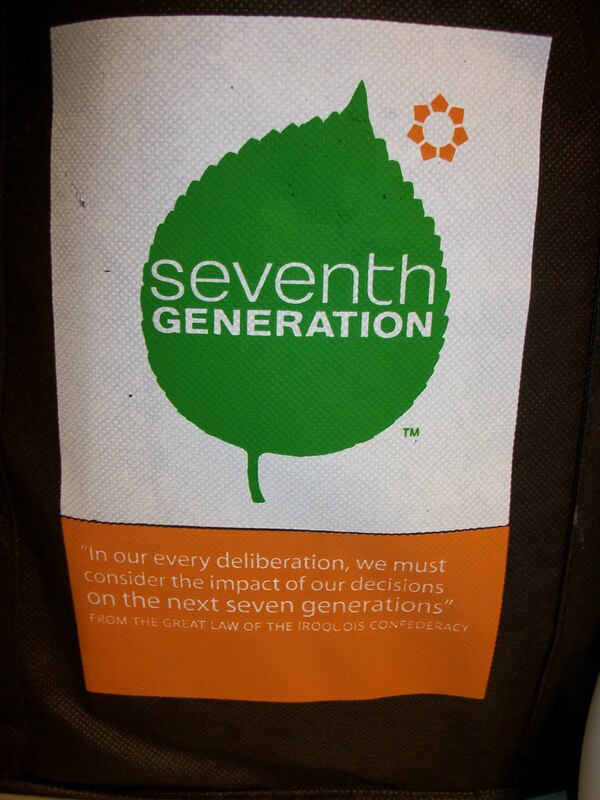 Seventh Generation proudly donate 10% of our profits to support organizations that work for positive change. A copy of the "Seventh Generation Guide to a Toxin-Free Home" can be downloaded from their web site. They do not have printed copies of the guide for mailing. I went to their website and learned that May was Pregnancy Awareness Month. I use my reusable cloth totes instead of using paper/plastic bags! I learned on the Seventh Generation website that they believe that the best way to ensure that they live up to their aspirations is to be completely transparent about their business and product practices. On the website, you can sign up for Seventh Generation coupons! I wish I could find more of these products in my area!! Seventh Generation, according to their website, has saved closed to 400,000 trees in their endeavor to be an environmentally friendly company. My hat's off to them! Kills 99.99% of germs* naturally. Effective against Influenza A virus. "Restore is the next reduce, reuse, recycle. We are working to ensure that our products have a circular lifecycle, meaning natural resources are being used and renewed at a rate that is always below their rate of depletion." I've been taking more stuff to the charity center instead of just throwing it away. I have started making my own natural cleaners! I learned that they offer coupons on their website and promotional offers! This year I'm really trying to reduce my use of my car and doing a lot more commuting and errand-running by bike. I'm also gardening and making my own organic garden sprays out of such things as vegetable oil, baking soda, cayenne pepper, etc., to fend off pests without chemicals. I learned that Palm kernel oil, which is used to make plant-based cleaning agents, has the single biggest environmental footprint of any raw material. We planted our own garden this year to stay pesticide free. Seventh Generation has partnered with the Safer Chemicals, Health Families Coalition to create the Million Baby Crawl campaign. The Million Baby Crawl allows consumers to join tens of thousands of Americans calling on Congress to strengthen federal laws regulating toxic chemicals used in products ranging from household cleaners to baby bottles. I have started making my own natural cleaners and stopped using paper towels. I like that they offer chlorine free feminine and baby products. I never even realized that there was cholorine in traditional varities. This year I've purchased more products locally, more locally grown produce and going to the local farmers market rather than driving to the health food store in another city. According to their website, baby wipes aren't just for babies! They can be used for so many other purposes - to wipe things of our own hands, off our pets, household furniture, etc. I make sure to always have reuseable bags along even at the mall. I make my own natural cleaners! We've replaced our lightbulbs to more energy efficient ones and we recycle. Thanks. We bought good bicycles for the whole family so that we can ride all over our small town instead of driving. The last time I was at the Food Bank, we had to package rice in ziploc bags. They were going to throw all the ziploc bag boxes away!! I took off all the boxtops for education and brought them to a school, and then I recycled all the empty boxes. We are recycling, growing a garden, and using more eco friendly products. I bought a new, energy-efficient furnace and started riding a bike locally. Subscribed to your blog via google reader! The best thing I've done for the environment this year is stop using paper towels and plastic cups! We started recycling almost everything this year. It is not required in out town, but it really should be. We recycle our plastics and paper products. I set up recycling boxes at work! We try to recycle everything here and also have the rest of our family doing it too! This year I have recycled and I use only re-usable bags when going to the grocery store. I also replaced all bulbs with energy efficient ones. I started using Skoy Cloths in place of paper towels. I joined your group on FB. We bought a filter for the faucet and use reusable bottles instead of buying bottled water. I've been recycling cans and paper more this year. I had no idea how harmful palm kernel oil was to our environment. I'll make an effort to find cleaning products without it from now on. I've started a compost pile! I'm using canvas grocery bags every time I shop.